← Spirit of Writing Week 3: The Internet is Your Friend…Use It Wisely. 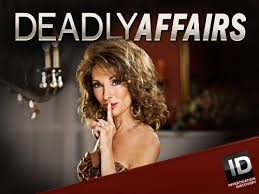 I appear as a featured author and commentator in two new segments for Investigation Discovery Channel’s true crime docudrama,”Deadly Affairs,” hosted by Daytime Emmy Award-winning actress Susan Lucci tonight, November 6th, starting at 10 PM EST/9 PM CST. I join victims’ survivors, law enforcement and legal counsel to make sense of the tragic murders covered in the episode hour.